This page contains information useful to members wishing to present workshops and institutes, or engage in other professional activities as representatives of the Virginia Geographic Alliance. Such activities usually require a proposal to the Steering Committee and must be in accordance with the Goals and Objectives of the VGA’s Strategic Plan. Such proposals should be submitted electronically to the Recording Secretary, Sandra Carter (mallard_src@cox.net), one week in advance of a Steering Committee meeting. Proposal Form: guidelines for submitting a proposal to the VGA. A Google docs version is available at http://goo.gl/a0wNlz Please copy and modify the proposal form as needed. NOTE: The VGA accepts proposals three times a school year: September 1st, December 1st, and March 1st. REMEMBER: There are now VGA registration fees for out-of-state participants. For overnight or weekend long events, if hotels and meals are included, the fee is $200. If it is a one day workshop with meals, no mileage it is $75. We don’t reimburse mileage. Fees must be collected up front prior to the event. Registration Template: Registration for VGA-sponsored workshops and other activities should use this template to assure uniformity and facilitate reporting to NGS by the state coordinators. This is a google.docs file. Are you giving a geography-related presentation at a conference such as VCSSE, NCSS, NCGE, etc.? VGA members may be eligible for financial support if funds are available. Submit your proposal to Annie Evans and Ed Kinman at the same time that you submit to the organization hosting the conference. Planning a to capture you event with photos? Or perhaps you are making a brochure and are looking for new pictures to illustrate it. How can you make sure that you are getting the best photos, and that you will have the right legal clearances to use them? Good news – National Geographic has prepared a Photo Gathering Toolkit as well as a Personal Release Form. Both are available on the Alliance Coordinators Community website. Request them from Alliance coordinators. See photos and write-ups from earlier VGA-sponsored activities. NOTE: VGA is a non-profit and as such qualifies for tax exempt status at many stores. When purchasing supplies and other items for workshops and institutes, please help lower costs to the VGA by using this provision at those stores that accept it. Keep all receipts in order to receive reimbursement. 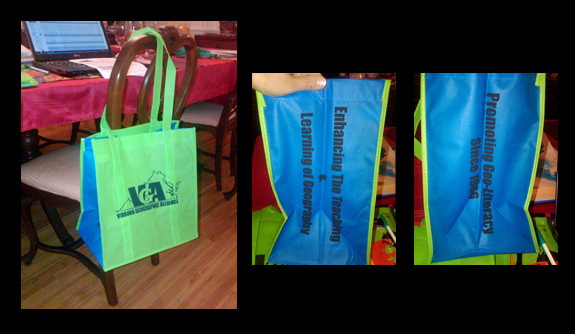 VGA bags are available to members presenting workshops and Institutes. Contact Annie Evans (evansa1@charlottesvilleschools.org) for more information. 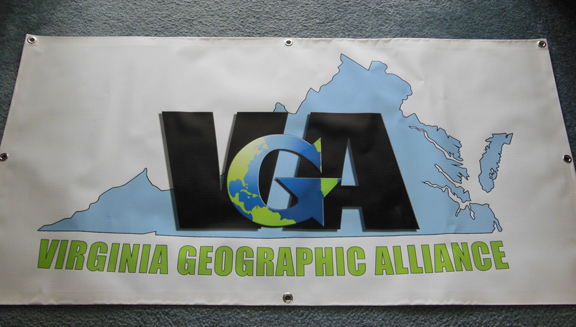 VGA banners are available for display tables. Three kits that include the banner are held in different parts of the state. Please contact the one of the following people to arrange to pick up a kit. Each kit includes, in addition to the banner, a table cloth, clips, and VGA flyers for distribution. 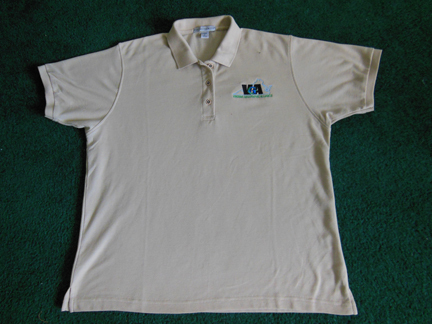 Shirts displaying the VGA logo come in a variety of colors and styles. You will need to order them directly from the supplier. If you are preparing a proposal for a workshop or other VGA-sponsored event, be sure to include shirts in your budget. The set up fee has been taken care of by the VGA. You only need to pay for the shirt. The shirt shown is “Silk Touch Polos” (K500 in stone color) by Port Authority on page 67 in the catalog. He will need the following info to place the order: Name, phone number, which item number, any other choice of color, size(s), quantity. He will call you to get credit card and mailing info. That info should not to be included in your email! VGA FLYER is available as pdf. Print as needed. A BRIEF HISTORY OF THE VIRGINIA GEOGRAPHIC ALLIANCE (pdf). Print as needed. 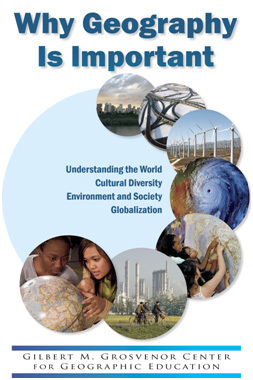 Workshops and institutes also may also obtain for distribution to participants the National Geographic two-sided political and physical map of the United States (approximately 24″ by 30″) and the booklet “Why Geography is Important” from the Gilbert M. Grosvenor Center for Geographic Education . Other items may also available for workshops. Please contact Bob Morrill (rwmorrill@gmail.com) to see what might be appropriate for your activity.